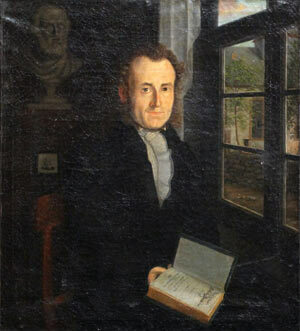 “Far West”, as Friedrich Muench was known far and wide to both his German and American readers, was born the son of a Lutheran minister in the small village of Niedergemunden Germany in 1799. Educated at home, he entered the University of Giessen, to obtain his ministerial degree, and became embroiled in the ideals of Ludwig Jahn, Karl Follen and the student revolutionary groups. Caught up with the assassination of Karl Sand, these groups came under close Government scrutiny, causing Karl Follen, older brother to Muench’s best friend and fellow student, Paul Follenius, to flee to America. The years following were increasingly difficult, and resulted in Muench and Follenius, who was by then married to Muench’s sister Maria, to lead the largest German emigration group to settle in Missouri, the Giessen Emigration Society. Relying on Gottfried Duden’s advice in his Report Muench co-wrote the Call for Emigration in 1833, with the goal of creating an American state of Germans. Many Germans considered this a Utopian ideal. Muench, leading half of the groups’ 500 members, settled along the Missouri River, on Lake Creek near Duden’s farm in the summer of 1834. Though not a German “State” Missouri did become a State predominately of Germans by the onset of the Civil War. A prolific writer, Muench wrote in both English and German, for the German population, on subjects ranging from agriculture to philosophy, with a deep devotion to his adopted Missouri and the subject of emigration. Ranging from poetry, to co-editing Der Licthefreund, from newspapers to books, his writings reached his loyal audience in many forms. With the death of his dear friend Follenius in 1844, Muench’s pen took up the challenge he saw facing Missouri. By 1854, he was speaking publicly on platforms as far as New York and Philadelphia on the issues of the day. In 1859, with the first edition of his book The State Missouri, promoted emigration to our state with a “book tour” through Germany. In May of 1860, after heated debates on who the Republican delegation should consist of, Muench was in attendance at the Chicago convention, even working behind the scenes according to family lore, to see Lincoln nominated. In 1861, he his speeches inflamed audiences in both Warren County and nearby Franklin County, on the issues of succession. A staunch abolitionist, his life, and his family and home were often threatened. He suffered a personal blow that year when his son Berthold was killed that August at the Battle of Wilson’s Creek. Despite the personal threats though, Muench went on to be elected to the Missouri Senate in 1862 for the First District, which included Warren and St. Charles Counties, counties with highest predominately German population in the State. Thus, Muench was embroiled in the politics of the State, and its dynamic role in America’s Civil War. If you are a Muench descendant, use the form below and get involved!